As former Georgia Bulldog icon Larry Munson would say, "Get the Picture! ": Atlanta -vs- Philadelphia. 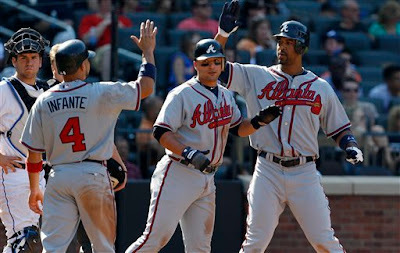 Atlanta is three games behind their Eastern Division nemesis with twelve games remaining on the 2010 Major League Baseball season. Half of those twelve contests will be played head-to-head with Philadelphia, three on the road beginning tonight, then three in Atlanta ending on October 3rd. The Braves hold a slim 2 1/2 game lead over San Diego in the National League Wild Card race. This is an old fashioned down-to-the-wire pennant race guys. Neither the division title, nor the wild card, is locked up by anyone at this point. One would have to like the Phillies chances simply because they have been playing better than Atlanta lately, even though the Braves are coming off of a three game sweep of the Mets in New York. Philadelphia is on a seven game winning streak of their own. One would not envision any team going into the 'City of Brotherly Love' and sweeping the defending champs at this point of the season. However, to win the division outright, Atlanta must take five out of these six to win the division outright. That's assuming they get zero help from any other club down the stretch. I don't like the Braves chances of pulling this gig off, but then that's why they play the full schedule out to the end. Who know what will transpire in the next two weeks? Nevertheless, it will be important for Bobby Cox' squad to continue to play well. The wild card accomplishes the same thing as the division title: it gets you into the playoffs. Just not with home field advantage.